Due to fire restrictions we have come up with a comprehensive virtual bonfire exhibit which is utilized to discuss bonfire customs in the British Isles. We broadened the scope to accommodate our local Celtic festivals which are not as tolerant of primarily UK customs as they could be. 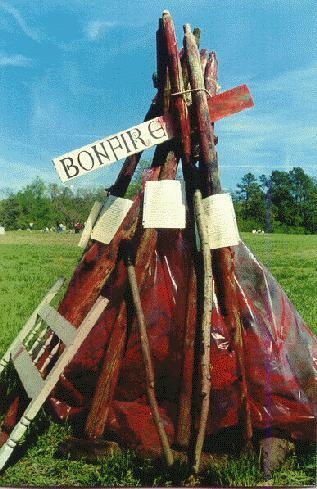 1.Virtual bonfire- fence posts painted with a bit of red and black paint with clear plastic sheet spray painted red and black and orange fastened inside able to blow in the wind.Torches Propped on bonfire. 2.On the bonfire exhibit texts describing aspects of bonfire in NI,ROI,UK,USA. 3.Bell with post describing bell ringing customs. 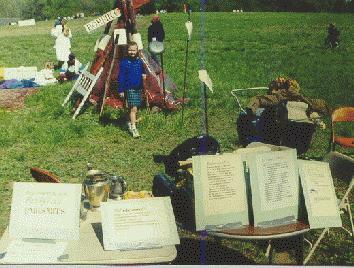 5.Welcome Table with organization literature and publications. We also signed up folk who wished to be contacted in regard to our Nov. 5 celebrations. A grand time was had by all. The fire was quite effective as it blew in the wind. celebrations of others and invite others to join us on November 5.